St. Francis Herb Farm Magnesium Chloride Crystals are ideal for body and foot baths. For hundreds of millions of years, genuine magnesium salts have been preserved pristine and untouched by modern pollutants deep in the crust of the earth, part of an ancient seabed that lies 1600-2000 meters under Europe. Magnesium salts, with all their vital benefits, are most readily absorbed transdermally through the membrane of the skin, the body's largest organ and critical to optional wellness. Directions: First, add enough hot water to dissolve 1 cup magnesium chloride crystals in a footbath or 1-3 cups in a bathtub. Stir if needed. Then add more water, filling the footbath or bathtub to desired temperature, ideally between 38.3oC (101oF) and 39.4oC (103oF). Great product. Really hard to find, so glad I found it on this site. What an amazing product. 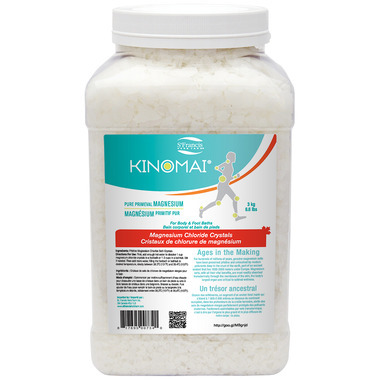 I'm not sure why this magnesium chloride works so much better than magnesium sulfate (Epsom salts), but it really does! I might never have discovered that had I not found it on this website and decided to give it a try. Soaking in a warm bath with this magnesium chloride seems to work way better for my arthritic, aching joint than soaking in magnesium sulfate (Epsom salts). I love it. Great price for the size. Making my own magnesium oil and this is a lot cheaper way to do it. I find it great for sore, tight muscles and headaches.